Cheers funky been a little rocky this week, I've reduced feed to 1.5ml/gal and she looks like she's loving it, over the last couple of weeks I stopped with the cal mag and this week reintroduced it to compensate the lighter feeding. 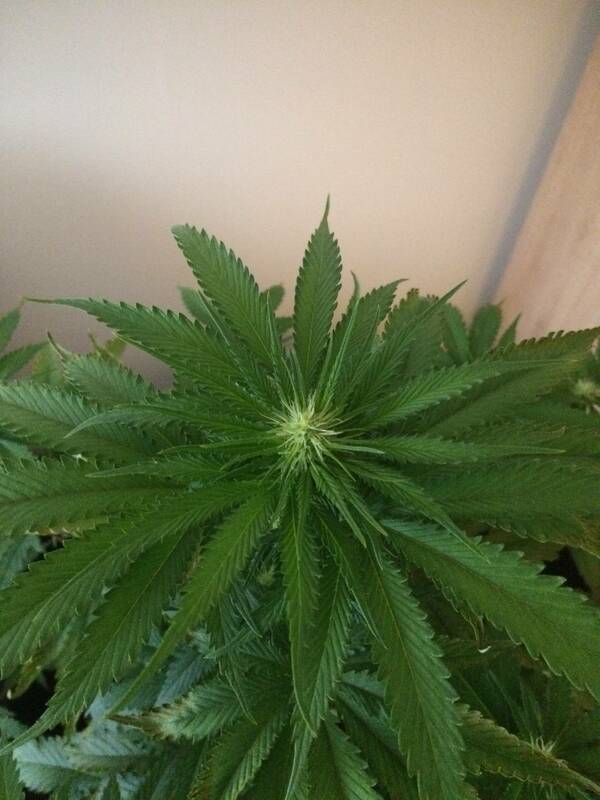 I really shocked her start of the week, I think it was either not fully mixing the nutes or not keeping an eye on ph, not entirely sure how I did it, she really drooped and next day got some serious burn on a few leaves, definitely learned my lesson there. Tied a couple of branches down so they get more light exposure. Started using canna boost too. How warm ya runnin in there? Those curled leaves indicate heat stress. Aside from the slight burnt tips. 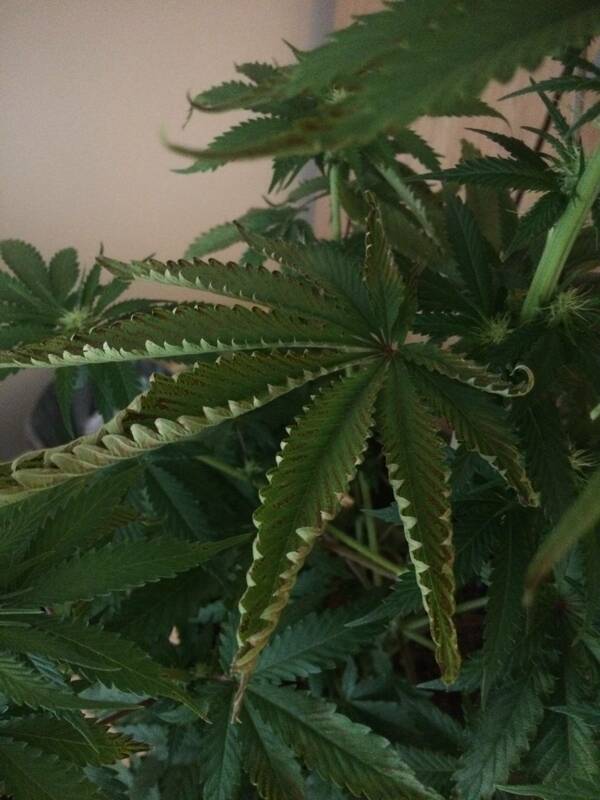 Beautiful plant tho mang. I think the burn is actually a magnesium deficiency from when you stop using it. Magnesium deficiency takes a couple weeks to really show. Is the burn brown or purple? 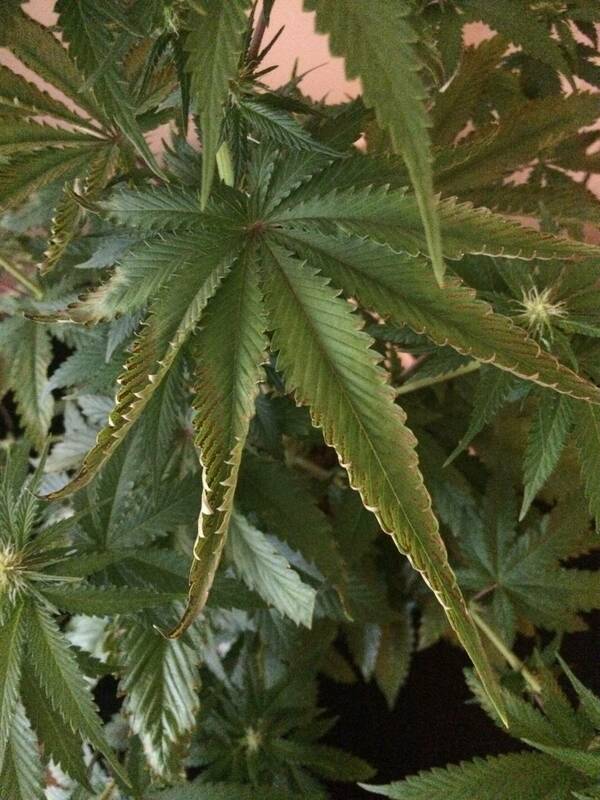 If it's purple it's probably a K deficiency .she is looking good tho. Temp? 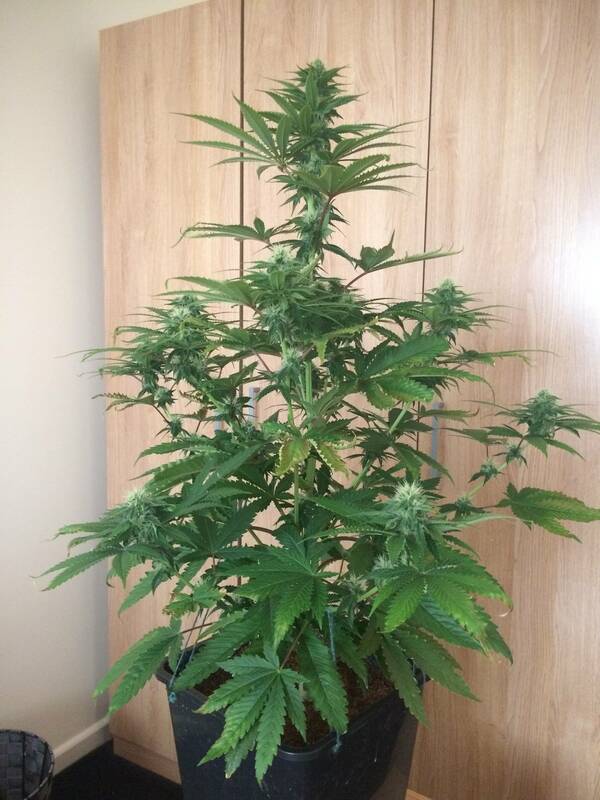 She will get hungry in flower so if she get N or K deficient just increase waterings not the nutrient concentration . Once you get the nutrients rite you can use the same thing from seed to flower just increase watering frequency. Just to clarify about the seed to harvest on one nutrient mix. K.I.S.S method, I used the Lucas formula with maxibloom from seed to harvest. I now use Jacks 3,2,1 which is more customizable, cheaper, and consistent (25lb bags). Cheers guys. Temps range between 26-29C in the day and drop to 22 at night. Now you say that funky I've been wondering if it's been a little mag deficient, some brown spots were showing a little and was contemplating weather to add a little epsum salt, that's when I decided to add the cal mag back in after you suggested to reduce feed a bit. That bad day though it fully wilted and the leaves that got hit bad did turn a bluish purple, the next day they crisped up. The night before I mixed up 2 gallons in a bucket at 3ml/gal, I'm wondering if it all got dumped in at once from a bad mix, had an early start that morning and was in a rush so didn't really pay attention. So if you say it's K deficient then maybe it got serious lockout? I like the idea of K.I.S.S method, for now I'm going to use up what I got from canna, I'm quite liking it so far. Canna is a good product just a little pricey . Definitely keep the cal/mag in the mix, sounds like you locked her up . 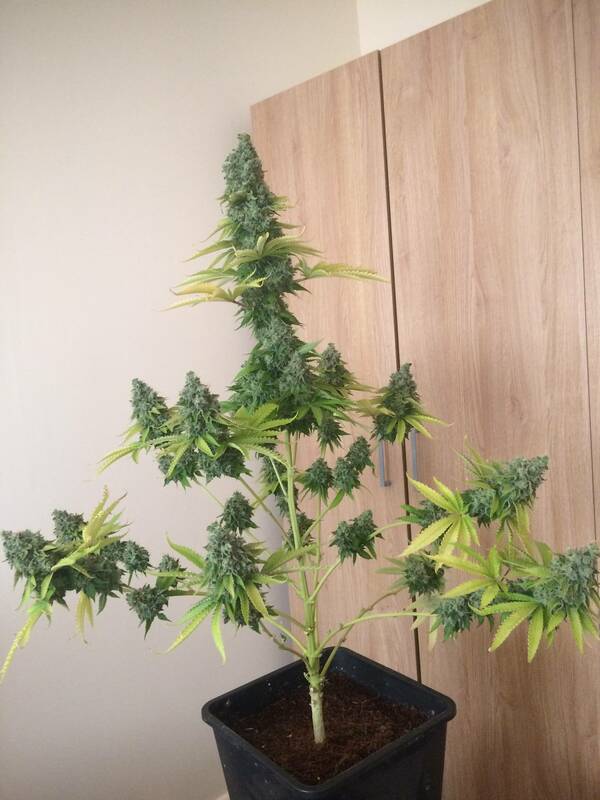 There tough plants tho she'll come back strong just get her back on regular feed. I use 1.2 grams Epsom per gallon but if you have cal/mag just stick with that. It's reddish purple and the leaf doesn't get crispy. The problem with this plant was unbalanced nutrients caused by a crappie bag of maxibloom or me pushing a bit much light. Ah dude, so not K deficiency then. How do you mean pushing too much light, as in trying to get as close as possible? Are those some phat nugz I see in the background? Rack down shot 1050par. 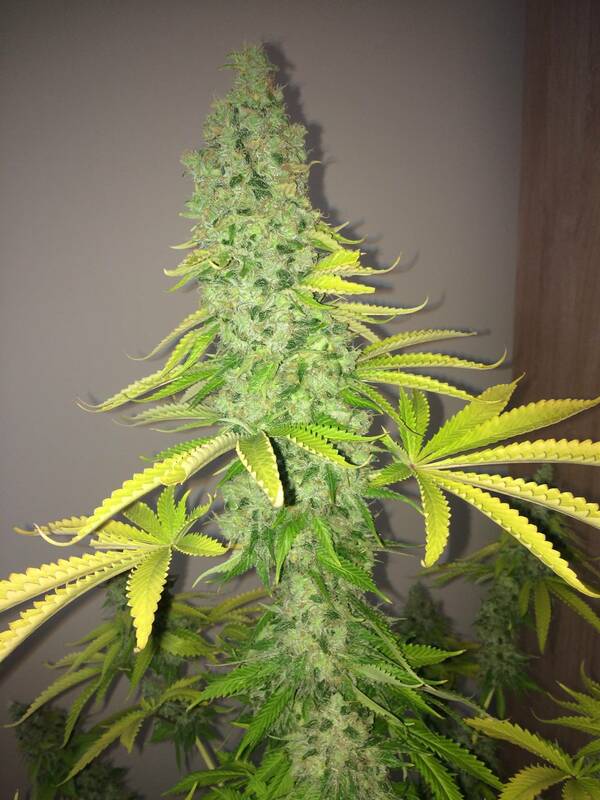 The yellow lady went 6 weeks in flower on the funky batch of maxibloom the green one is 3 weeks I think, it's on the new stuff so it didn't get hurt. But at that par plants go through a lot more nutrients and that's what happens when they don't get enough nutes . They get ugly with reduced yield but I'll still get over 2 zips dry tho. This cut takes a beating and still puts out. I hope you get everything worked out. You sure its not just lockout? Thats bit weird from just growing to fast to much i think. 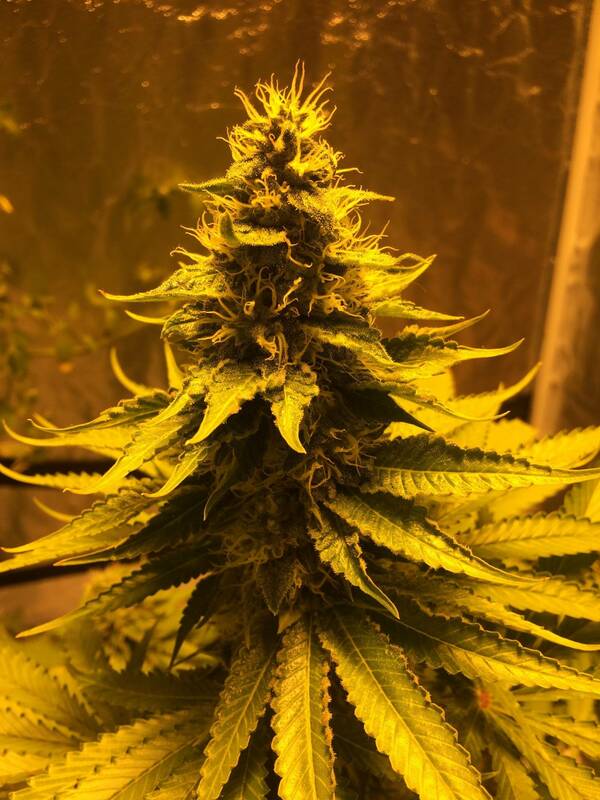 When too much light lower on the plant wpuld be better and nutes particularly n yelllw from bottom not just heat causes leaves to grt crispy calaused almost.. of u were approuching too much light with led bleaching is pretty common also can happen with certain hps if cool enough if i am not mistaken. Anotger clue is possibly that funky nutrient likely has "locked up" all the nutes before u even mix it. Not sure what ur growing in but can attempt to flush and add freah nutes.but could be weird insolubles. 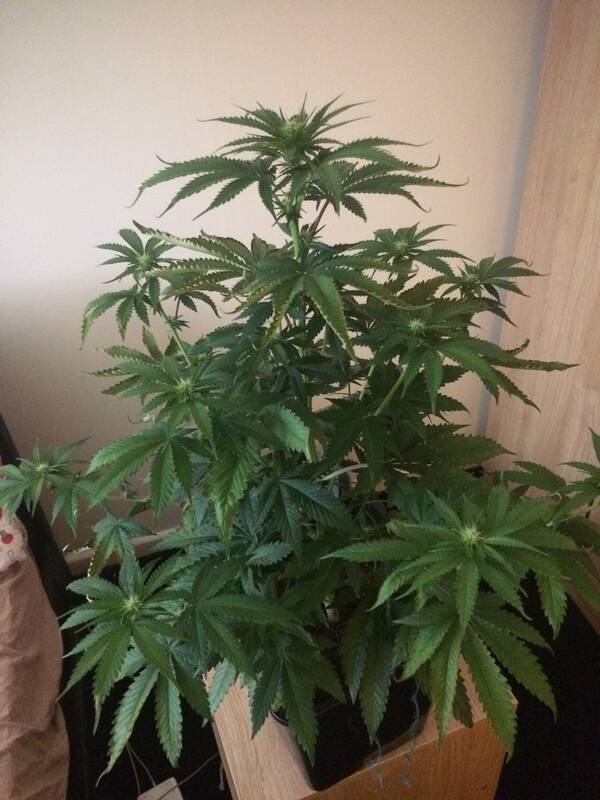 May be able to save plants and 95% sure its not from too much light pretty classic burn then lockout..
Just a quick update, been 24 days since I flipped her to 12/12, not sure when you're supposed to start counting the official flower period, some say 1 week some say 2 or 3 days, want to gauge it right so I can hit the pk booster. 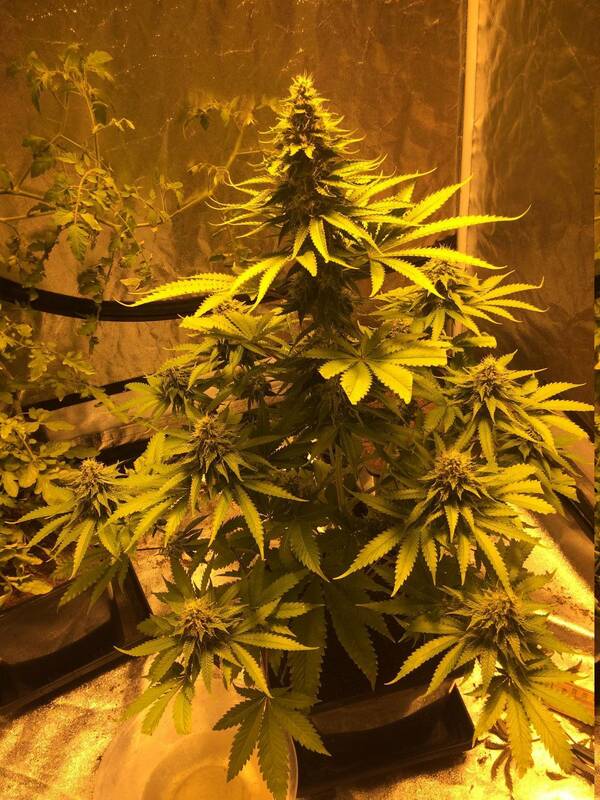 As I lifted it up I hit the top bud on the light. Classic noob error. 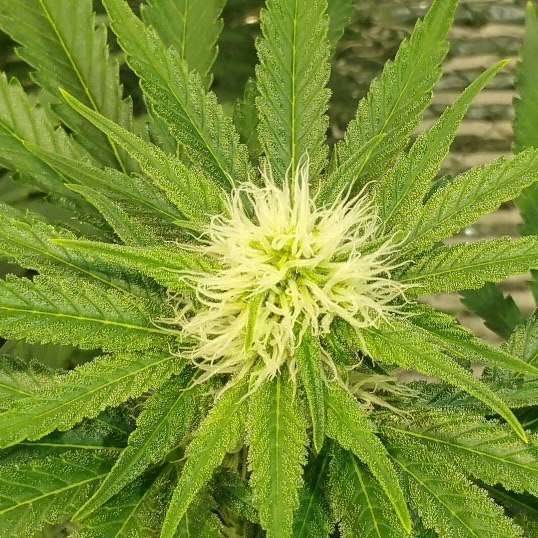 When you say watering every day, sometimes two times, is that with nutes or are you referring to a separate event, in addition to a daily feeding? Trying to understand what's going on before I attempt my first kill, I mean grow, lol. So around 35 days in since the switch, some hairs started to turn brown, sampled a little oven dried popcorn bud and was pretty good, looking forward to harvesting. Started with pk 13/14 this week, dropped a+b a bit as I'm increasing the pk to about 4-5ml, going to run it to the end of next week. Everything else still same, adding rhizotonic and canazym every now and again. Just getting through these next couple of weeks and will be on the home stretch for the flush. Looking really good. According to Canna you should go no more than 7-10 days with PK. 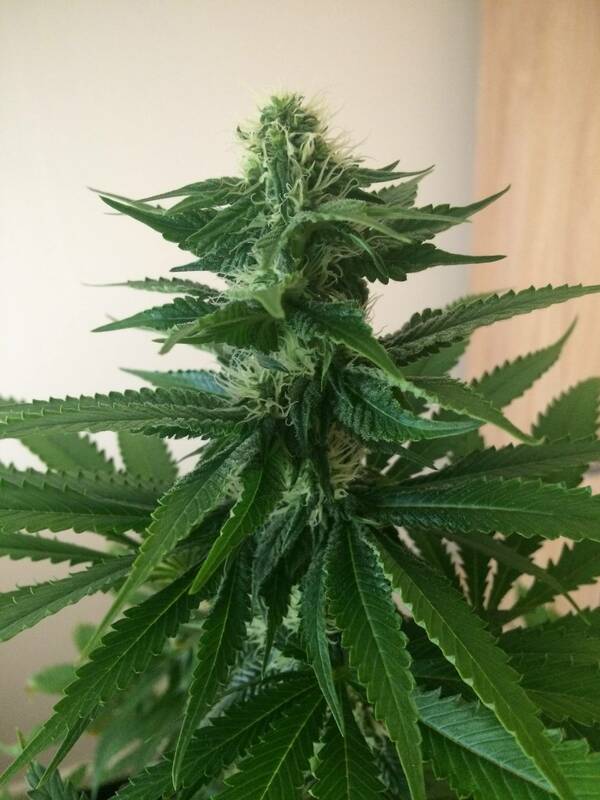 The stuff builds up in the coco and will keep feeding your plant after you've stopped. Enzyme products need to be added all the time. You might not notice the effects in the beginning, but if you will in the end. As time goes on the roots shed their outer skin and die off will clog the root zone. You try and water but the water puddles up on the top and rolls out to the side, or it goes in and straight down and out of the bottom before it has a chance to saturate the entire medium. Enzyme products keep the root zone clean and clear of all that sludge and allows the plants to actually access the nutrients. Enzymes and myco are dif. You shpuldmt have to add myco innoculate your roots more then a few times after that its sort of a waste if using soil or ammended soiless mediums. Enzymes are better to keep bio sludge outta your hydro reservoir. If u have good life in your soil less mediums enzymes are pretty much a waste except for preping old soiless for reuse. But even then debatable as spent alot of effort uping organic content dor slow nutriemt release why do u want to turn it to carbon and solubles to be "instantly" leached? Used up faster in any regard. When all bennies use that organic stuff to thrive on. Rhizotonic is not microbes. Its an algae based root simulator. Canna is against large amounts of beneficials for coco. They use tricederma on their coco to fend off any contaminants but their philosophy is that since your feeding the hydroponic nutrients that are ready for uptake that you don't need them. The microbes also compete for the nutrients your trying to feed the plant. Thanks for the comment and input phycotron. 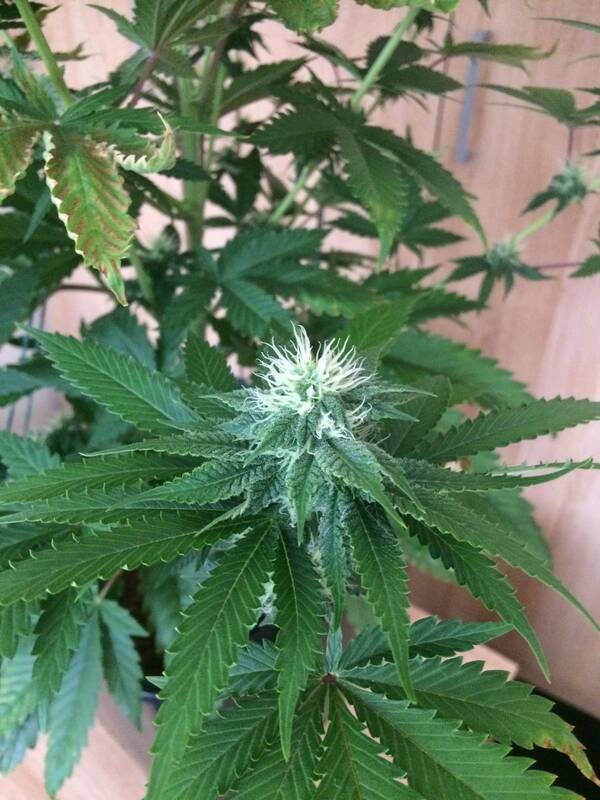 It's nearly harvest time, I slowly cut feed to 1/4 strength week before last and have been giving plain water with boost, rhizotonic and cannazyme for 1 week since last Saturday, nearly all leaves turned yellow which easily picked off. Still watering once every 2 days. Have been away a lot recently so I've added an intake fan with a duct bringing cool air from downstairs into the tent, it's worked quite well and allowed me to keep the tent closed. Also been filling up a 2ltr bottle and leaving it to trickle down so it didn't dry up whilst away. Leaves at the bottom of main cola are still pretty green so think I'll leave it another day or so. Lookin nice. If you take the shade leaf off BEFORE you chop it down it makes things easier. Looks like you got it pretty easy this time. 8,383 topic views. 1 members, 6 guests and 25 web crawlers are browsing this forum.